Shield, Sword and a Secret ship, unlockable at events or defeating a mothership. 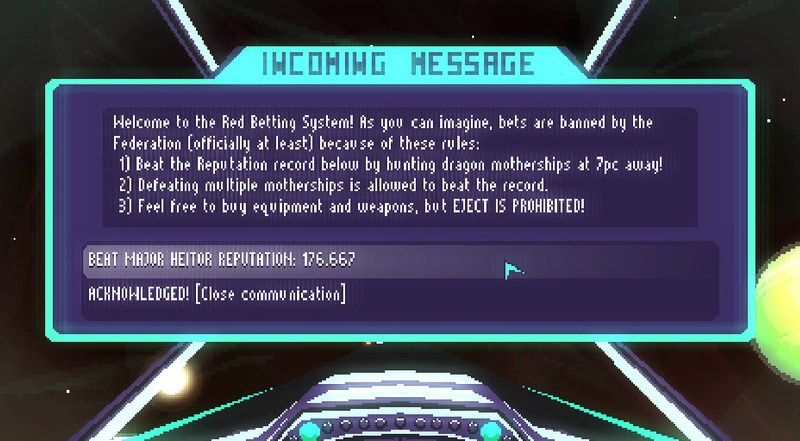 Join illegal gamblers who bet their Reputation points on uninterrupted jumps. The pilot have a huge amount of Scrap to equip the Ship and try to beat a target Reputation. Each time you try to hit the current Reputation, it increases. Be failing or succeeding. Every move counts, every defeated enemy is precious. This game mode is only playable after defeating at least one mothership (on any difficulty). Everyone who has already defeated one has the unlocked mode. In response to requests, there are now three different difficulties. Each of them changes mainly the amount of "energy" that the enemies have, in addition to some other minor details. The "Hard" mode is only playable after defeating at least one mothership (on any difficulty). Everyone who has already defeated one has the unlocked mode. New mechanic to amplify the "Failure Spectrum": If your ship gets hit by a 4 dmg blaster and have only 2 hull it will have the hull reduced to "0" instead of exploding. From "0" any damage will obviously blow it up. The ship's scanner has been completely reprogrammed and designed. Now it shows in an organized way all the elements present in the Tile, including the amount of Scrap and Energy! The Scanner can also be turned on and off just by clicking on its icon or using its current shortcut. New DANGER indication: when you move the mouse on a Tile that has any element that damages the current ship (taking into account the different collision sizes) a Skull Symbol will flash. This works even with the Scanner disabled. Many minor improvements and bugs have been fixed. If you encounter any problems please report on the forums.